Good quality for the price. If on the fence between mems medium or large, go large. It is made to be fitted not loose like a sweatshirt. Thick enough fleece to wear a t-shirt under. This soft spun fleece is perfect for all weather wear. This mid-weight fleece is highly breathable and the bottom hem has a drawcord and toggles for a complete look. Just wanted a simple black, fleece top to wear around the house. I'm a M/L - size 10 in women's. This men's small is a little snugger than I prefer around the hips than I prefer, but not a deal breaker since the price was more reasonable than the women's I looked out. A pull cord is so much better than a gathered or cuffed bottom hem. 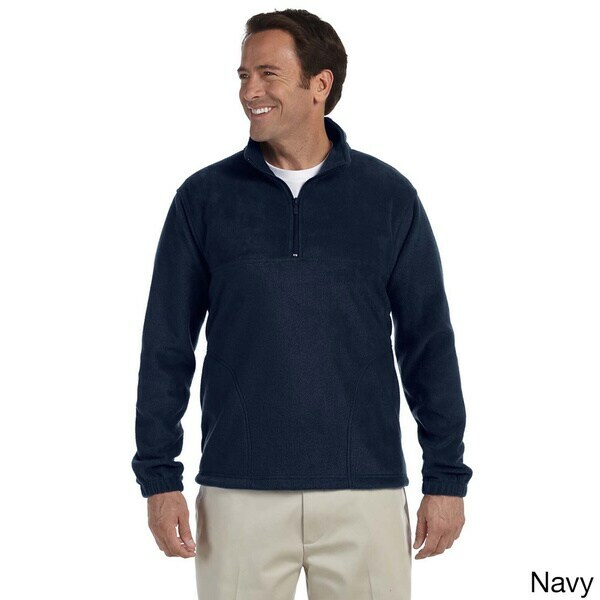 This pullover fleece is lightweight, cozy warm and good looking. Great for golf on chilly days. Nice item. Good quality, but apparently sizing runs small. I purchased for my husband in his usual 3X, but it was snug in biceps and chest. This one has to go back. He really liked style and color. Hated to disappoint. He loves it and wears it all the time! "What brand is the Men's Quarter-zip 8-ounce fleece pullover? Item No. 16356336??" Hello maga3baseball, we are unable to disclose the manufacturer of some of our products; however, Overstock.com stands behind every product we sell. When necessary we can contact suppliers if a product issue arises. Thank you for shopping with us. Terri D.